Thinking under Yellow Hat is totally opposite to Black Hat, it means positive logical objective thinking. Yellow color in decision making symbolizes sun and light, so this hat makes us consider all positive moments of our solution or decision, think over optimistic results of the mission, estimate the advantages and benefits. This hat is especially effective for problems solving, when the situation seems to be negative, so looking for positive moments may encourage making correct and most effective decisions. Green color of the hat symbolizes grasses and fertility, so thinking under Green Hat means using creativity in order to generate some new ideas, to look for alternatives and fresh approaches, and to analyze possible ways of solving the problem or decision making. This concept requires speculative thinking, which can be done with the help of a number of creativity techniques. Finally, Blue Hat thinking is the last stage of the whole strategy. It makes us summarize and control the results obtained from all the previous “colored” procedures. During group thinking this stage must be performed by its leader. Blue color of this hat symbolizes skies, so it makes us look at the solution or decision from above perspective and try to understand, whether we came to the right solution or decision or not. If the ideas are not sufficient and the problem needs more attention, we can be back to Green Hat thinking. Blue Hat thinking is very important: it requires skills to overview, to analyze and to control, together with abilities to use meta-cognition. As it is possible to understand from the description of the method of Six Thinking Hats, it can be more effective when performed in group, because this way a number of different independent personal opinions can be obtained and considered. It is remarkable that every each procedure of thinking must be performed by ALL members of the group, without selecting people for each particular hat according to their personal characteristics (for example, Black Hat thinking must be done not only by “natural” critics or pessimistic individuals, but by everyone in the group). This technique of decision making is especially valuable and useful in commercial and business environment, where correct decision making becomes principal point for successful functioning and progress of an organization. This strategy of thinking helps to focus and concentrate on the problem, to get broader view of the situation, to develop abilities of clear lateral thinking and creativity, to improve communication skills, and, therefore, to fasten the procedure of decision making. Six Thinking Hats strategy can be used in many different situations: for example, when administration of a company is trying to make a decision about expanding their business, launching a new trade mark, constructing or renting new buildings, opening a new affiliated office, or employing another CEO, etc. Also, we can use this method individually, when our decision requires some serious consideration and creativity. It can be, for example, solving some interpersonal problems, or making decision about moving to a new house. But in some particular cases, for example, when the problem does not require deep thinking and extended analysis, when there is not much of available information or data connected with the problem, when all the risks are low and decision must be made fast, or when proper decision can be made randomly, this method may not be very useful due to its relatively big expenses of time and bulkiness. This strategy is universal, very effective and widely applicable to all decision making situations. It does not require any special preparation or training (though some authorized training groups do exist), so it can be performed by anybody in any place. Many giant and powerful companies, like IBM, Polaroid, DuPont, British Airways, Federal Express, Pepsico, and others, successfully use the method of Six Thinking Hats for making important business decisions and looking for the most effective business strategies. 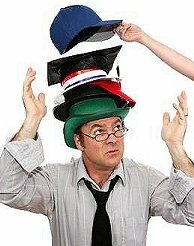 The technique of Six Thinking Hats is a perfect practical tool for effective decision making. It promotes creativity and helps to avoid possible mistakes in selecting a solution or decision. It allows combining critical rationalism and positive emotions in order to receive better output. It helps to make the process of evaluation and decision making much more constructive and productive.